Born and raised in Glasgow, Scotland, John Paul Fitch has been an avid lover of horror since an early age, when he was raised on a diet of "video nasties" and Stephen King novels. He has been writing since 2008 in a variety of fields including horror/weird fiction, comics, and television. 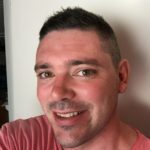 In 2014, John Paul was shortlisted for the Australian Shadows Award for short fiction for his story "Nip, Tuck, Zip, Pluck" and his story "Pyramid" was also published in the dark Urban Fiction anthology Keeping the Edge. He has been a finalist in the ACE Comics and Games Best Australian Comics competition, and named as a rising star of the comics industry by Den of Geek web-site for his contribution to 215ink’s Ignition anthology for his story "How Xarg Got His Groove Back." A graduate of Perth Actors Collective’s Directors Program, John Paul was nominated for the PAC Stanislavsky Award for his work in short film. John Paul lives in Perth, Western Australia with his wife and three children. He is currently putting the finishing touches to a collection of short stories and is hard at work on his debut novel.